How does Iyengar yoga differ from other types of yoga? Over the next little while we’ll be exploring these questions via our Blog in a Blog Series called “What is Iyengar Yoga” In each post we’ll take one key idea or concept that Iyengar yoga is interested in and explore what that means in practice. 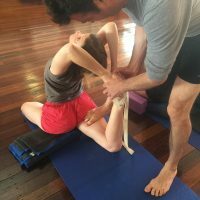 If you’d like to share your thoughts on what Iyengar yoga is or how it differs from other types of yoga, send us an email at info@marrickvilleyoga.com.au with ‘What Is Iyengar Yoga?’ in the subject. In a general sense, Iyengar yoga is based on the Hatha tradition, which was developed in accordance with the Yoga Sutras as set out by Patanjali over 2000 years ago. Developed by B.K.S. Iyengar, the Iyengar approach to yoga is part art, part philosophy, part science and aims to keep people healthy, inhibit the development of disease, and help people to recover from sickness. Iyengar yoga is essentially interested in the true nature of health – in attaining mental, physical and emotional freedom through the rigorous practice of asanas working towards pranayama. Since there are a wide range of principles and philosophies behind the Iyengar approach to yoga, we thought we might approach these questions from the inside out. Rather than try to nail down the concept of Iyengar yoga we’ll take as our beginning one of Mr Iyengar’s seminal texts – Light on Life – and start to post some of our ideas about some key ideas that Iyengar yoga. In this way we’ll work towards understanding what Iyengar yoga is and how it might differ from other types of yoga. To start our ‘What is Iyengar Yoga?’ blog series let’s look at the idea of precision. Once again, we’d love your thoughts as we go along. 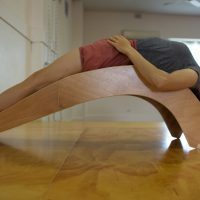 Please send an email to info@marrickville.com.au with some of your thoughts about what Iyengar yoga is and how it differs from other forms of yoga. Iyengar yoga is interested in precision, timing, and sequence: in Iyengar yoga, nothing is done casually. Poses are practiced with intention and require a certain discipline around listening to and following instructions. In the Iyengar method the teaching is extremely particular and detailed. Some of us find this confronting at first – feeling that it is ‘slow’ work and feeling that we should be ‘doing’ more. Perhaps this is because we are not accustomed to thinking about such fine motions and it is interesting that it actually becomes apparent over time that the way we practice in Iyengar, while highly methodical, has an acute intensity. The thing with Iyengar is that it is all about structure and process – not racing ahead to the final result, outcome. The Iyengar approach to yoga is based on a deep and resounding respect of the mechanics, function and needs of the body, and that is why we prepare the body for each asana, building on the most basic foundations such as standing on our two feet. Practicing yoga with attention to detail is good for the brain. In listening to and following instructions, we are also gifted an opportunity to practice developing essential life skills such concentration and focus. Through the teaching of asanas specifically and consciously, the Iyengar method offers students the opportunity to not only develop physically by practicing certain skills, but to develop mentally and emotionally as well as we begin to acquire certain tools that will help us in our practice and in our lives outside yoga. This is also an important part of progressing in yoga – not simply getting to a certain level and staying there. Progressing in yoga, over many years, requires the capacity to begin to turn our attention inwards. This idea of continual progress relying on method explains in some part the qualities Iyengar yoga teachers possess. Rather than taking on the role of the ‘expert’ or the ‘accomplishment’ the Iyengar yoga approach encourages humility as one progress, and a constant and ongoing engagement with the philosophies and principles which are the foundation of yoga: meaning at each stage, no matter how advanced, all yoga practitioners are essentially students of this ancient art.